When Dallas Fort Worth International (DFW) Airport needed to rehabilitate its busiest arrival runway, the goals were to find a solution that used innovative engineering techniques, minimize the time the runway was out of service, support the airport’s commitment to sustainability and keep future maintenance costs low. After more than 30 years of use at the world’s fourth busiest airport, DFW’s Runway 17C/35C was ready for a rehabilitation, becoming the first runway to be fully reconstructed since the airport’s opening in 1974. DFW partnered with Jacobs, its on-call civil engineer, to evaluate the runway and determine options to move forward – and our team made a surprising find. 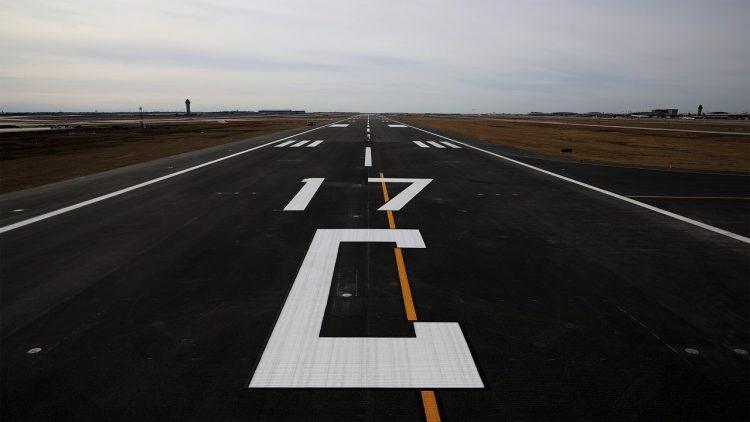 The rehabilitation of 17C marks the first time DFW has used asphalt as a runway surface. The material is weather-resistant and can withstand temperatures of 190 degrees Fahrenheit without melting, making it a feasible option even under the hot Texas sun. Changing from concrete to asphalt achieved several benefits. Because there would be less demolition, the construction schedule was reduced – minimizing the amount of time the runway would be out of service. Costs were reduced as well; the construction estimate for full depth concrete replacement was upwards of $150 million. With the asphalt overlay option, total costs for the project were around $130 million. Asphalt also simplifies future runway maintenance through the next 40 years of its useful life, as repairs to asphalt can be done at night, instead of shutting down the runway for extended periods. As the nation’s first carbon neutral airport, DFW has an unwavering commitment to sustainability. Jacobs developed a Sustainable Design Strategy that incorporated ideas from design through construction. By keeping a good portion of the runway intact, there was significant reduction in the amount of materials going to a landfill, as well as the emissions from trucks to haul it there. Materials that could be reused on this or other airport construction projects were preserved. In addition, the enhanced runway includes LED lighting, which can go for longer periods of time before being replaced and reduces the airport’s utility consumption. Once into construction, the DFW, Jacobs and contractor teams worked closely together to execute the design, problem solving in real time to overcome unforeseen obstacles such as continued rainy weather.